It is the dome consecrated to the first among the Apostles, to the first Pope and head of the Church: it dominates also from the terrace of the structure hosting the Haitian delegation; it stands out on the landscape and overlooks the whole scene. In Rome, however, getting lost is impossible: if you just look up you will find an enormous, pretentious sign that gives back the right coordinates. Like the Basilica of St. Peter, like every testimony of a past that justifies the title given: Eternal City. 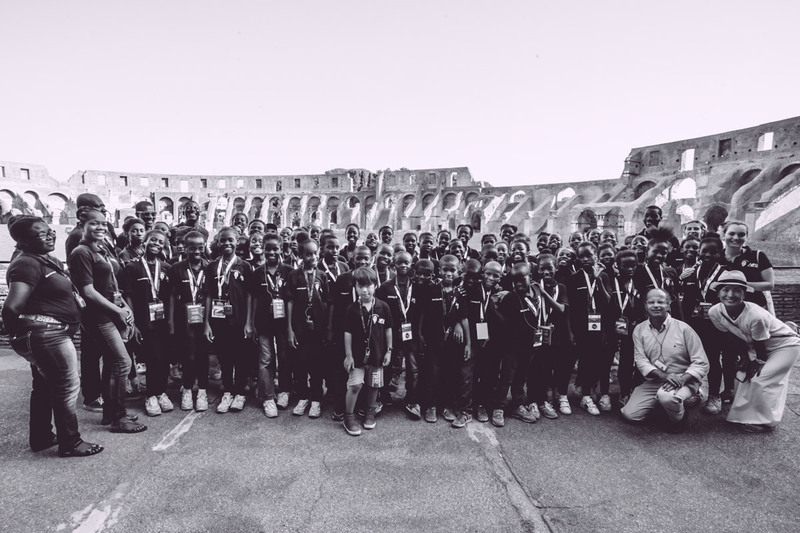 It was Holiday time for the sixty young ABF artists and their Haitian companions: a ‘two day’ holiday in the capital, that was starting by, temporarily, expatriating to the smallest nation in the world: the group was going to visit the Vatican Museums, the heart of the Papal State. Available for an exceptionally reserved visit, statues, paintings, tapestries, archaeological finds, invaluable works of art exhibited in the same salons where popes, cardinals and emperors had once passed, where many, big wide, open, Caribbean eyes, were now parading, to absorb such beauty. After dinner, at the same time as Andrea was in Poland in Stettino, and was singing in front of two hundred and fifty thousand people, Rome by night was slowly creeping at the sides of the two-story panoramic coaches, while they were driving the ABF-Fondation St Luc choir along the route of a Night city tour. The following day, pure play, pure muscular exercise, and running around, for the sixty children, in the park of Villa Pamphilj. It was also an occasion for the bravest among the adults to improvise a basketball tournament, challenging the hot temperature, with the match Haiti – Italy. (For the record, both sides did their utmost, but Haiti had the best). Saint Peter’s Basilica was the next destination of the ‘Voices of Haiti’: a colossal structure having twenty-two thousand square meters of surface, forty-five altars, eleven chapels, ten thousand square meters of mosaics and dozens of masterpieces – like Michelangelo’s ‘Pieta’, like the bronze Canopy of Bernini – the sacred place brings so much wonder as pragmatic relief, given the outside extremely hot temperature in the early, summer, afternoon. A dazzling backdrop for the surrounding Bernini Colonnade, the ‘San Pietro’ facade overlooks the Baroque square of the same name, a pilgrimage destination from every corner of the globe. There, Leonardo, ABF’s archaeologist and friend, special guide of this Roman visit, showed the children the prospective magic that can be enjoyed, at the height of the central obelisk. It was then the turn of the Colosseum, the most famous Italian monument in the world, a heritage of humanity, witnessing two millennia of history, an expression of ancient, eternal beauty. In just over a month, inside the amphitheater, Andrea will sing along with Elton John and many other artists and friends in a “once in a lifetime” charity event, whose proceeds will go partly to the “Muhammad Ali Parkinson Center” and in part to ABF projects. From the Flavian Amphitheater, the delegation went on foot, along the Imperial Forum, to the foot of the Capitol and Piazza Venezia. Now the time had come to go back, time to say goodbye to Rome and Italy, (and also to part of ABF staff). Tomorrow a plane will bring the Haitian delegation to Paris: just the time of a short tour of the French capital, and the last European night, before flying towards Port-au-Prince. The ‘cupolone’ profile accompanied that bitter – sweet- atmosphere of every tour end, a cocktail of tiredness and tenderness, of great confidence gained (that soon, all adults know, will be fatally reduced), of promises to keep in touch, to meet, in Haiti or in Europe, or anywhere in the world, where sing together, (together with Andrea). Also because the projects, in that sense, are many, and even bigger, unequivocally, ambitious. Children wanted to thank their own way, dedicating to their teachers and to all, a song that they had specially studied: “Arrivederci Roma”, the song that for sixty years has spoken to the heart of those who have to leave, those who are saying good bye, and are naming, once again, the beauties of the city. An exceptional tourist – Goethe, no less … – said of Rome: ‘In this city is linked the entire history of the world and I count on being born a second time, the day I set foot in it.’ Hoping this will be true for our little friends and for all, and not only in Rome, not only for this Italian debut, we wish (dedicated to everyone) a continuous, real renewal, a personal growth, and a constant inner revolution. That, as the founder of ABF reminds us, is the only truly sustainable, the only one possible.